For the first time in years, I took a trip out to the tip of San Francisco — Lands End. 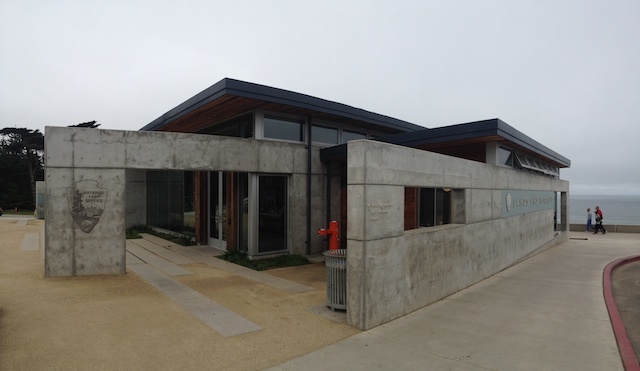 Rather than the dusty rutted parking lot I was used to, its been spruced up and now sports a beautiful new visitor center and trails, courtesy of a partnership between the National Park Service, Golden Gate Park Conservancy, and the Goldman Foundation. What surprised me most was how the building seamlessly blends a visitor center, gift store and coffee shop in essentially one space. Looking at the folks sheltering from the wind inside, it seems a smart and dare I saw surreptitious was of providing some interpretation while people shop and warm up with coffee! Great building. Fabulous setting. Thank you!